Fresh berries are some of my favorite fruits and strawberries are at the top of my berry list. We’re fortunate to live so close to Florida, where the fresh strawberry season runs from December through April, so we have them available for a very long time. Our fresh berry season here starts to come in just a week or two before the Florida season ends. In another few days, we’ll have u-pick places open everywhere! What makes berries of all kinds so special is their high levels of phytochemicals which are nutrients that help protect cells from damage. According to a recent study, women who eat about two servings of strawberries a week experienced less mental decline over time than their peers who don’t. Reason enough for me to enjoy strawberries as often as possible! 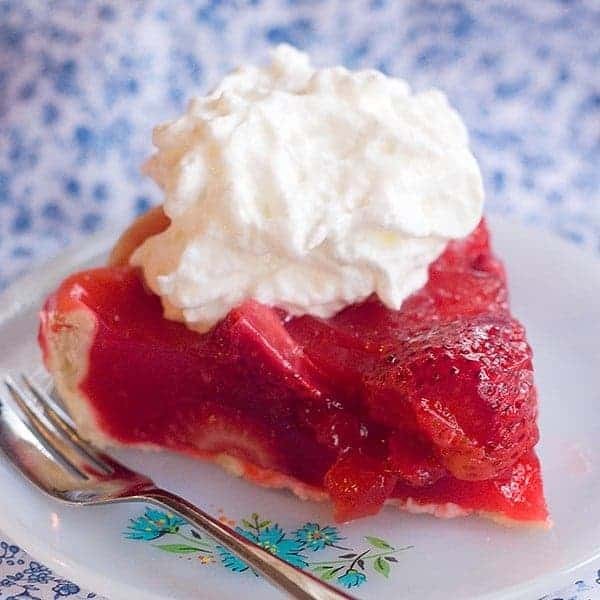 One of my favorite strawberry recipes is this familiar Fresh Strawberry Pie made with sweet, sweet strawberries and everyone’s favorite – Jell-o. It may be old-fashioned but oh my goodness is it tasty! I like to serve this one as a delicious ending to Sunday dinner. I hope you’ll enjoy it, too. Before you start, you’ll need to prepare a pie shell. You can use a frozen or refrigerated one, or your favorite homemade recipe. For this pie, I like to cook the pie shell until it’s just barely browned. Wash the strawberries, remove the stems and cut larger berries in half. Set aside. In a heavy bottomed pan over medium high heat, whisk together the sugar and cornstarch. Slowly whisk in the water. Continue whisking until the mixture is boiling. Cook until thick and clear, stirring constantly. Remove the sugar mixture from the heat and add the jello, stirring until dissolved. Add the strawberries and stir very gently to coat each berry. Pour into the baked, cooled pie shell. Chill until firm. Serve with whipped cream. Fresh strawberry pie made with Florida strawberries at the height of their season! In a heavy bottomed pan over medium high heat, whisk together the sugar and cornstarch. Slowly whisk in the water. Continue whisking until the mixture is boiling. Cook until thick and clear, stirring constantly. Remove the sugar mixture from the heat and add the jello, stirring until dissolved. Add the strawberries and stir very gently to coat each berry. Pour into the cooled pie shell. Chill until firm. Serve with whipped cream. That just looks like Spring on a plate! Thanks! It does, doesn’t it? I think my Grandkids will love this pie! II looks yummy,can’t wait to try it, I will be my one taster! Prepared your recipe and spread the Jelloed strawberries in a graham cracker crust. So simple and so delicious! Thanks for sharing.